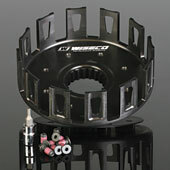 Wiseco leads the clutch aftermarket with high performance FORGED clutch baskets, inner hubs, and pressure plates. OEM clutch components are made from inexpensive die-castings that quickly wear out and become easily notched. Wiseco offers the only forged clutch components in the aftermarket for off-bike and ATV applications. The feature aligned grain flow in the aluminum adds strength and toughness to the parts that are unparalleled through other manufacturing processes. Each Wiseco clutch basket, inner hub, and pressure plate start as dedicated forgings built specifically to take advantage of features that can only be made through the precision forging process. Variable fillet blends and complex surfaces can be forged into the part that would otherwise be extremely difficult to produce. The raw forgings are then precision machined to very close tolerances, producing the same high quality parts as Wiseco pistons. The finished parts are hard coat anodized and Teflon coated to offer superb wear resistance, and a long life of smooth clutch operation. Every new clutch basket is supplied with new components used during assembly, including new fasteners with pre-applied thread locker. Wiseco friction plates are made to exact OEM specifications from premium materials to offer the same feel and durability of stock frictions. They hold up best for the widest range of applications, and offer longevity and durability in extreme riding conditions. Wiseco steel and alloy drive plates hold up to extreme riding conditions and are machined to exceed OEM tolerances. Steel drive plates offer the same feel as the OEM, and alloy plates offer better grip for quicker lock-up in race applications. Wiseco clutch covers are machined from hardened aluminum and offer improved side case protection and puncture resistance over stock die-cast clutch covers. These clutch covers are also hard coat anodized for added scuff resistance and good looks. We will stand behind all Clutch Baskets, Inner Hubs, and Pressure Plates by offering a LIFETIME WARRANTY if they were purchased after 1/1/2009. This warranty covers breakage and notching and covers the original purchaser when proof of purchase is presented directly to Wiseco Piston Inc.
contain everything you need to upgrade your worn out clutch plates and springs. Each kit comes with new frictions, steels, and clutch springs, all made from premium grade materials. The frictions and steels are made to exact OEM tolerances and specifications, and produce the same feel and wear resistance of OEM plates. Wiseco clutch springs are 8-10% stiffer than stock to ensure a positive clutch lockup every time. 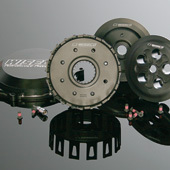 Clutch pack kits are an easy solution to worn or slipping clutch packs. take the clutch pack kits one step further by including a Wiseco forged clutch basket and new rubber cushions. Wiseco forged baskets are tougher and stronger than stock, and achieve higher fatigue properties than any other clutch on the market. The hard coat anodizing wears like iron, and greatly extends the life of the basket against notching. Also included is a full set of frictions, steels, and clutch springs made from premium grade materials. Refresh your worn out clutch and notched basket with the ultimate in high quality Wiseco clutch components. give your off-road bike or ATV that factory-racing feel. Wiseco Extreme Clutch Kits come with everything you need for a full clutch replacement, including a forged clutch basket with new cushions, forged inner hub, and forged pressure plate, all hard coat anodized for the perfect feel and ultimate in wear resistance. Also included is a full set of frictions, steels, and springs made from premium grade materials. When you need the best in forged clutch components, choose Wiseco for that factory-racing feel and extreme performance!